Maharajapuram S.Srinivasan is the grandson of Sangeetha Kalanidhi Sri Maharajapuram Viswanatha Iyer and son of Sangeetha Kalanidhi Sri Maharajapuram Santhanam, veterans in the field of Carnatic Music. 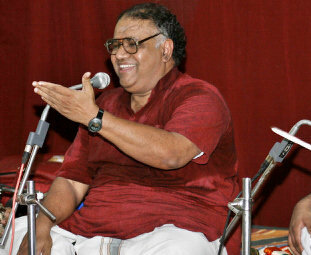 Maharajapuram Srinivasan, an acclaimed musician in his own right has been performing music concerts individually since 1986. He has had the good fortune of being the primary disciple of both his grandfather as well as his father and has thus imbibed their rich musical heritage. Endowed with a fine feeling for melody, he combines the Lakshana and Lakshiya styles handed down to him by his ancestors and desires to prove his mettle as a chip of the old block. I am not able to download the concert of maharajapuram sreenivasan.Kindly make it available.